SPECTACULAR! 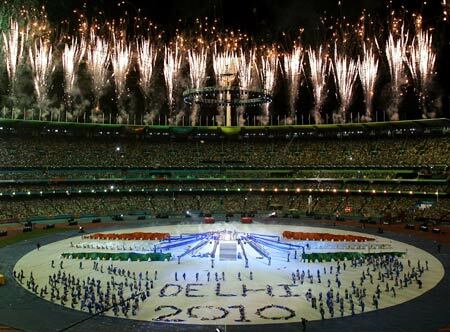 This year's Commonwealth Games, Delhi 2010 were truly spectacular and very satisfying to athletes and viewers. This year's games' were mired in controversy. One wondered whether they would take off, at all!! Anyway, all's well that ends well!! 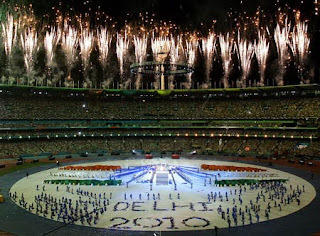 So what is the take home message from the 19th Commonwealth Games, New Delhi, 2010? The message is that we INDIANS ARE PAST MASTERS AND (PRESENT AND FUTURE) MASTERS OF crisis management!! When things look hopeless, you will find that Indians have an inborn quality of doing necessary jugaad or street smart innovativeness and salvage the situation. Jugaad includes frugal engineering but not necessarily strictly so. When Citibank was in a deep mess and required a messiah to salvage the situation, it was Vikram Pandit who took the bull by the horns! India is in a permanent state of chaos. First time visitors to India are stunned by the dust, heat and general muddle. In fact, they wonder how India ticks, being in a permanent state of chaos!!?! For us, Indians, management of challenging chaotic situations, is, of course, all in a day's work!! We Indians are deeply tolerant, hence, we can take in all the chaos very equanimously! We call this chaotic situation as unity in diversity! This diverse and chaotic environment gives us a special quality to do jugaad and try and come out of the tight situation. India is the well known 'capital of diabetes of the world'! Polio (42% of world's patients are in India), tetanus and pertusis are also prevalent significantly in India. This is as per World Health Statistics 2010 released by WHO. But this deplorable health situation seems almost implausible after seeing the fantastic opening and closing ceremonies of Commonwealth Games, 2010 at New Delhi! But the above health situation is true and represents a great continuing opportunity for pharma marketers to try and improve the health situation. Managing crises is a second nature for us. We are sure we will be kaamyaab in bringing a turnaround in the health situation of India. For that firstly, we have to agree that there is a crisis. That is difficult for us Indians!! However, until we agree there is a crisis we will not act! Once we know that a crisis is on us, we will put the act together, that is how we Indians behave! Otherwise ... chalta hai!! Today the fact is that India is booming. Economic liberalization has created an economic resurgence. Yet, it was not a proactive liberalization policy that was brought in! We were shamed, way back in 1991, when IMF (Indian Monetary Fund) bailed out a bankrupt India. This forced the Govt. of India to liberalize and galvanize the Indian economy. This caused growth of Indian economy. We should hit a crisis - only then do we wake up! That is why we Indians are great at crisis management - the evidence is the Commonwealth Games, 2010!! Crisis means an unpredictable event has occurred and it needs to be managed. Today, we are sitting on a major silent health crisis. Private entities and Govt. bodies need to take on the challenge facing India before it becomes recognized as a crisis issue. It is a silent crisis today, but when international organizations start coming in to India, in a major way to save the health situation of India, we will only be collaborators with these entities. Global healthcare NGOs are seeing a big opportunity in India. Will we Indians require international attention and guidance to improve our healthcare situation or can we do it ourselves? Thanks for reading this blogpost, please scroll down and read all other blogposts, click on older posts as and when required. Please feel free to recommend this blog to your friends. Thnks for taking pain to share this blog with your circle of influence.